I found these two on from a grocery store with the name "aloe mix". The other has very thick fleshy leaves with light green stripes. The other looks more "Aloe" to me. The leaves have white horizontal lines in them. That's the trouble with buying plants from a supermarket - their supplier can ship them anything, and call it whatever they want. 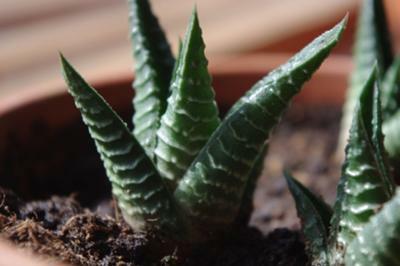 Fortunately, what you have are not Aloe, but Haworthia, which are much better behaved, and also do better with lower light levels common to many homes. 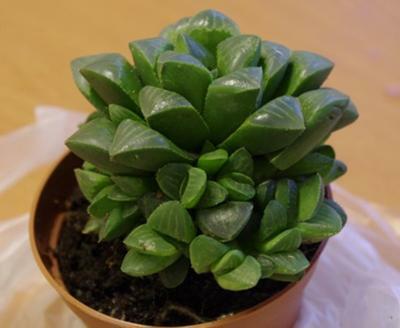 The chubby leaved one looks like Haworthia mirabilis - which translates to 'the beautiful Haworthia'. The one with the stripes is Haworthia fasciata or Haworthia attenuata, both very similar and requiring the same care. Haworthia are well worth the trouble to find out how to care for them as they provide beauty and low maintenance in one compact package. Those mixes are full with surprises. Now that i've watched pics of Haworthias, it seems that those "aloe mixes" contain only them, though i've never heard the name before.